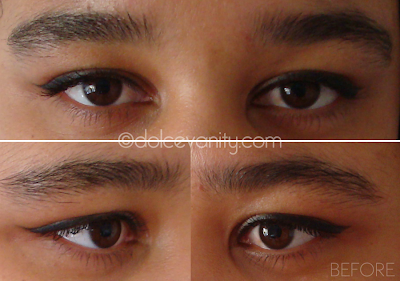 Remember my post on my consultation with Michelle at Beauty's Within about HD Brows ? I went back Tuesday to get them done. I wanted to keep them full and of course gorgeous. These were my eyebrows before ( eeeeek ) how lovely. I won't lie, I did get use to walking around like this so it was kind of bitter-sweet getting rid of them - crazy I know. I was just so excited! Michelle told me that she was going to mix some brown and black .... she applied the dye and left it for a little while. When the dye was taken off I could already see how much more filled in they looked & that was because of the invisible hairs that we cannot see that are invisible to the naked eye, they are so light but with the dye it fills them in and we get a fuller looking brow. The waxing, we had discussed the shape last week and I was happy with that as I adore low arches so Michelle got to waxing and then tweezing out the hairs - there was also the longer hairs that with HD brows are NOT plucked out they are trimmed down into the brow. I was then allowed to see my brow ... I was literally in shock too many valley girl "OMG" and near enough tears, it was just amazing. The next eyebrow was then paired up & the hairs going up towards my hairline were then threaded to blend into the waxing. Michelle's work is very thorough when she took my after photo I looked and I thought it looked great but Michelle spotted a few hairs and when she took the picture again and compared it with the last it looked even more even and paired up. Me being the eyebrow obsessive didn't even notice and I think it's great that Michelle's work is very precise as she said to me she works on her clients as she would like someone to work on her, she would not allow someone to walk out if they are unsatisfied. To me that's what makes a great business & beauty therapist. Fellow beauty addicts, what are your thoughts? Would you try HD Brows ? Just perfect, they look so natural. To go from that before to this end result is just pure talent. They look great! aww I love them Doll,AMAZING!!!! Wow they came out great. I am sold! I love clean eyebrows!!!!! It looks very nice on you! I really like your blog!!!! Your layout is very nice!!! Maybe you can check out my blog and tell me what you think. I love clean eyebrows!!! They look gorgeous on you!